Izawa House (旧井澤家住宅) is one of the traditional houses located in Ina, Nagano Pref. It was constructed in early 19th century. So, it is almost 200 years old. Izawa family was a merchant, but because they help the village, they are allowed to carry Katana as Samurai. It is the largest house in Inabe-juku. It has a great architecture style of Edo period. Admission: 200 yen for adult, 100 yen for under junior. 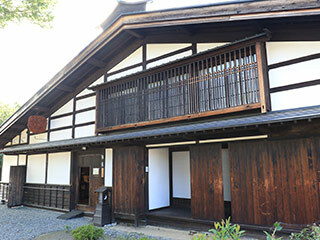 Izawa House is the only remaining house of Inabe-juku. Inabe-juku was the connection town of Nakasendo Road and Inakaido Road and Kosyukaido Road. So it was very important for the travelers in Edo period. Izawa House is the largest houses in Inabe-juku and the only building that has Hafu Roof. Izawa family was used to be a great farmer and also run Sake Brewery. It is 2 stories building with large earth floor and a stable inside. There are 11 rooms and one of them are used as a store. There are large beams on the ceiling. You can see the great achitectures of the traditional house in Edo period.